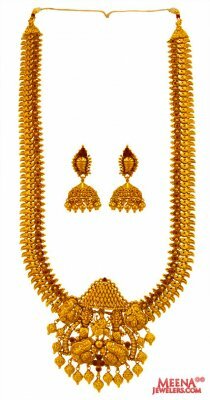 22K Gold temple necklace set is excellently handcrafted with embossed Peacocks and Goddess Durga. Antique finish with studded red colored stones and filigree work adds traditional Indian touch to it. Set is ideal for a Bride to carry it on her big day. Necklace is attached to a dori and is adjustable. Hanging pendant 82 mm long and 54 mm width. Patta is 9 inches long and 19.5 mm wide. Earrings are 41 mm long and 18 mm wide.